I’ve long been needed medication cabinet due to so many prescription medications I take everyday. Think about the design for a while and get inspiration from antique Chinese medication cabinet. The Ming dynasty first made medication cabinet with extensive use of hand-cut joinery. I believe ancient Chinese didn’t have any power tools so they had no choice but to make all the joinery manually. However, I live in 21st century, so use Domino extensively and made doors using router. I’ve had many surgeries, so take about at least 15 prescription medications everyday. Now diabetic supplies, blood pressure cuff, extra medications, syringes, ... all in one place. Bummer about all those meds, but at least they have a nice place to live. Dude, That’s a lot of drugs! Reminds me of my father-in-law. Before he passed (last May) he would go to the VA about every 6 weeks. He’d always schedule all his Dr appointments on the same day so as to not have to drive back and forth on consecutive days (50 miles each way). Anyway, he’d come home with 8 or 10 new meds every time PLUS he had a closet FULL of drugs that the VA kept mailing every month automatically. After he passed we found 12 bottles of 800mg aspirin in one of the closets. One day my wife went with him and after about the 4th Dr appt, she asked one of the nurses if any of the Drs ever conferred with each other to make sure all these drugs were safe to take together? Every time he went after that my wife would take all his meds (a grocery sack full) to the pharmacist and he’d check them for her for any kind of “Bad Juu Juu” interactions. More than once the pharmacist found a couple that could not be taken together. Oh, sorry ‘bout the long rant. That IS a very nice cabinet you built! Could be used in most any room and look beautiful as a stand alone piece. It’s a masterpiece.I hope to never need such cabinet,in fact i am on the way to make a tea cabinet. It’s a fun to read your long story. I also monitor drug inter action. Fortunately my wife is a hospital pharmacist, so she has extensive knowledge. Sometime she goes to the doctor’s appointment and talk with doctors directly before doctors prescribe any new one. Bud you wouldn’t need this big one but tea bags may need very delicate sorting. 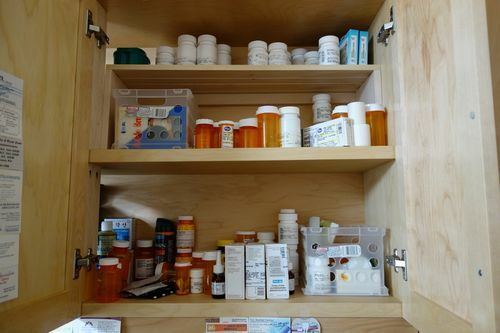 Sorry about all the pills you have to take, but at least you’ve got a beautiful cabinet to store them in! When you get well – Which I hope is very soon, you can throw away all the meds, and use it for you most treasured tools!!! Wonderful cabinet, your surgeries have not impacted your craftsmanship, this piece is simply beautiful!! This is beautiful, I love the front legs, and how all the colors work together. Very nice work. Well done! You can tell a lot of processes went into that piece. Here’s to your improving health ! Just wow! Nice job and as others have said, your medicines will have a great storage solution. What are the rough dimensions—it looks about 4 to 5 feet tall and 18 to 20 inches deep, maybe? How many different woods (primary) did you use? This piece and all your other work, and photography is superb. It is a bummer about the need for all the meds, but it does not look like you let it get you down.